Been wondering around the gym aimlessly? Not getting results from the routine you've been doing for years? Need to spice up your current routine? Haven't workout in a while and don't know where to start? Need someone to guide you and help hold you accountable? Want to take your fitness to the next level? Personal training is just that personal. 110 FIT blueprints a customized workout plan that maps to your ability, fitness and health goals and beyond. FREE 15 or 30 minute Consultations - focused on: goal setting, way ahead, where to start, fell off the wagon, motivation, etc. 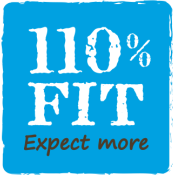 If 110 FIT is not the right fit for you, we will point you in the right direction. 1 on 1 sessions start at $65/session. 2 for 1 Partner sessions start at $85/session.